From left, Jose Castillo Montenegro ’19 of Chile, Maia Nikoladze ’19 of Georgia, Tanzeem Lodi ’19 of Bangladesh, and Valeria Chavez ’21 of Peru interned at the U.N. headquarters in New York last summer. Jose Castillo Montenegro ’19 of Chile, Valeria Chavez ’21 of Peru, Tanzeem Lodi ’19 of Bangladesh, and Maia Nikoladze ’19 of Georgia traveled across the world to attend Clark University. 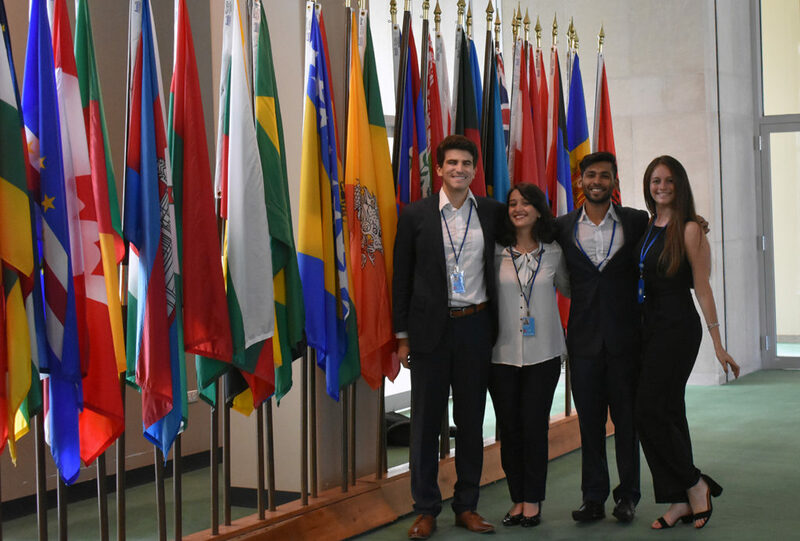 Last summer, the four political science majors found themselves sharing another common experience: interning for their home countries at the United Nations headquarters in New York. The students participated in high-profile conferences and meetings of diplomats, and researched issues ranging from international security to public health. Besides applying their skills in political science, they also drew upon their second majors: economics for Castillo, Lodi, and Nikoladze; geography for Chavez. The three seniors received funding through the Political Science Department’s Harrington Fellowships to intern at the U.N. The students’ U.N. experience built upon the connections they’ve made at Clark, which have provided them with opportunities to meet students from more than 80 countries. On campus, the four have been active in student organizations while also gaining experience in politics, economics, and international relations. Castillo, Nikoladze, and Chavez have participated in Clark’s award-winning Model United Nations program, and Nikoladze and Castillo served on Clark’s Undergraduate Student Council. Castillo and Lodi are active in the Clark Investments and Trading Society, and Nikoladze was a Peace Corps campus ambassador. They also met students through regional clubs, such as the South Asian Students Association, Latin American Student Organization, and European Students Association. Off campus, Castillo and Nikoladze interned for the office of U.S. Congressman Jim McGovern. Below, we asked the students to elaborate on their experience at Clark and at the United Nations. When you were looking for universities in the United States, why did you choose Clark? What’s it like to be an international student here? Chavez: I came to Clark because I knew that it was going to be a small campus and a one-on-one experience with professors. I knew the geography and political science programs were really good, and it was totally true. I’ve been having a great academic experience, and I’ve learned so much in the past year and a half. Castillo: Clark is a great place for international students, and puts a lot of emphasis on bringing kids from abroad. I like the school’s philosophy that it enriches the campus culture … because it brings different viewpoints and contributes to more healthy discussions. Beyond that, Clark sponsors a lot of cultural clubs. I used to be a part of the Latin American Student Organization, and there also is the International Students’ Association. Clark has many events, like International Gala [featuring dance, music, and other talent acts] and International Journey [featuring food from all over the world], that help international students feel more at home. How has Clark helped prepare you for internships and careers? Nikoladze: For my academic and professional development, Clark professors have been the most helpful. Most of the professors I know are very accomplished and well-known in their respective fields. For example, Political Science Professor Michael Butler helped me get my first internship. Clark professors have never hesitated to write a recommendation for me or give me professional advice. I believe that Clark professors are a great resource for career development, and all the Clark students should take advantage of that. In addition, the Political Science Department’s Harrington Fellowship was really helpful. I like that Clark University provides numerous funding opportunities for students who want to do research or internships. Chavez: My experience at the United Nations would not have been possible without Clark. Clark opened the doors to the world for me, and I am extremely grateful to be here. I feel like I can do anything. How has participating in Clark’s Model U.N. program helped you? Castillo: In my sophomore and junior years, I participated in Model U.N. That experience helped me in my internship at the United Nations. Model U.N. helps you with public speaking and teaches you to take initiative. It gives you the whole background, the overlay, for understanding the U.N. and how it’s structured. Chavez: Participating in Model U.N. has prepared me for working at the United Nations, and it also has given me all these soft skills that I am able to use at work and in class — being able to speak my mind and build a coherent argument. Nikoladze: International relations courses at Clark and Model U.N. are really helpful because you do a lot of group work and a lot of simulations. That was really helpful in the United Nations internship because once you’re there, you have to build connections. You need to know how to interact with people. The beauty of Model U.N. is that delegates almost never represent the country of their origin. They usually have to learn about the position of a state they are not familiar with. The most unusual experience is when you have to represent a position of a country that you personally disagree with. All of this teaches you that you do not always feel comfortable with the position you take, and that you have to adjust your position according to the situation. Chavez: What you see is that diplomats don’t necessarily agree with the positions their countries have. It’s not about you as an individual; it’s about the country’s position. How has the U.N. internship shaped your future plans? Nikoladze: This internship convinced me that I am very enthusiastic about international relations. One of the things about international relations is that it is not limited to politics. Other fields, such as economics, history, and culture, are crucial in understanding international relations. I believe that interdisciplinary approach is key in carrying out successful foreign policy. I would love to do academic research about international relations topics or work for an international organization. Having done an internship at the U.N, I feel very confident about my understanding of diplomacy and international relations. Chavez: I am currently taking a class called Introduction to the History of Genocide. My practical experience at the U.N. helped me further understand how these concepts from class — which can be really abstract — can be applied to real life. My ultimate goal is to be a human rights lawyer and work at the International Court of Justice or the International Criminal Court. The contacts I’ve made at the United Nations, one of the largest bodies that protect human rights, will help me get there. And I’ve been able to access the United Nations because of Clark. Lodi: “Pre-U.N. me” and “post-U.N. me” are two different people right now. I learned how to network. When I’m hunting for jobs, internships, and opportunities, networking is the most important skill. If you know people, if you know how to interact with people and impress them, they will remember you. My plan after college is to apply for jobs in consulting or public policy firms before I head to graduate school in the future. How have you evolved as a person because of your time at Clark? Nikoladze: I came here with a very narrow purpose of doing well academically. After my first year, I realized that there are many other opportunities, and I started looking for clubs to join, and volunteering and internship opportunities. Clark has done a lot for me. Clark has helped me establish myself not only academically but personally and professionally as well. It helped me develop my communication and cooperation skills, which are very valuable in today’s working environment. Castillo: Beyond academics, Clark has opened my eyes a lot. A lot of my views were very closed before coming here — and not only socially and politically, but in daily life. That [realization] is productive for many students. It teaches them that their life and their way of looking at the world will not always be the same, and that shouldn’t be a reason for conflict but it should be a reason for discussion and perhaps unity.